How many of you are prepared for life's medical emergencies that may come your way when traveling? I know for myself personally, I'm prepared as much as humanly possible. 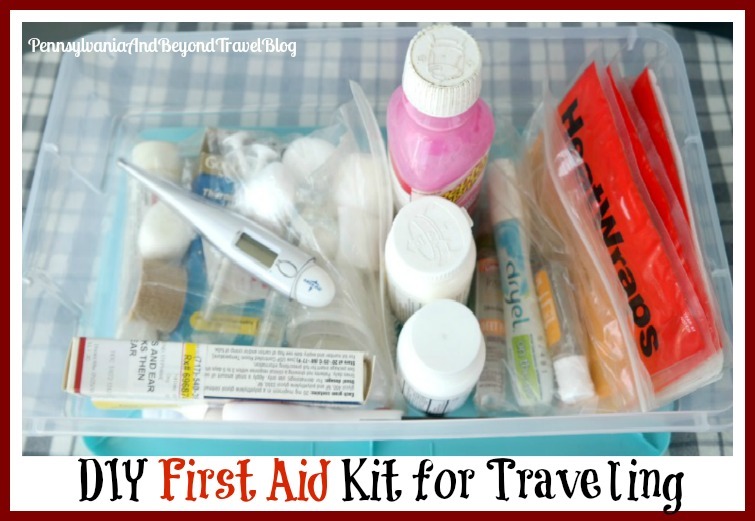 When we travel it's important to take along a First Aid Kit that's packed with medical items that you may need if you come down sick or have a minor accident. Having some supplies on-hand can help ward off trips to the local drugstore, clinic and/or emergency room. In some cases, you could even save a life...by having some of the basics on-hand for emergencies. Two years ago we decided to put together our own first aid kit and let me tell you, it has come in handy at least a half-dozen times over the past two years. You can use a plastic container with lid or a small travel bag to hold all of your items. Some of the items on our list will depend on the ages of the people you're traveling with and any medical conditions that they may have. Prescription Medication: You'll want to pack enough prescription medication to last for your entire trip, plus for 3 full extra-days. If you get stuck out of town, you'll want a few days of extra medications to get you through. Medical Information: We made a list of our important medical history and printed it out onto cardstock. On the reverse of that card we included a list of our preferred hospital, doctor's phone numbers & an emergency contact name. We then laminated the card and keep it tucked inside our first aid kit. Current Medication List: If any member in your traveling party takes medication on a regular basis, you need to make a list of the name of the medication, dosage and prescribing information. We make a new list every time we travel, since medications can change on a regular basis. Keep it updated! Once we return home from traveling...I go through our first aid kit to see what was used and what needs to be replaced. Before we leave for our next trip, I go through the kit again and see what needs to be replaced. You always want to double-check expiration dates on medical products and replace them as necessary. In addition, you want to leave as many products that you can in their original packaging, especially medications which will help you get through checkpoints with ease. I agree with everything in your kit and find a Medical travel kit to be very handy. The only thing I would add is a pain relief cream for arthritis.